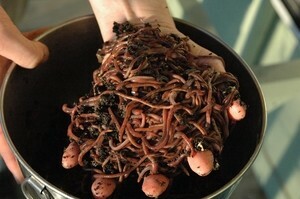 Yes that's right, the new addition to our farm are worms... not your general earth worm, but actual composting worms. Now a little background information- when we bought this place it had an innovative waste system; as we do not have your general domestic system and 'town supply' for either our water or waste. Now whilst this does reduce the rates costs (Council tax- to those in UK), it does mean you have to have an alternative source or system in place. The system installed was actually really good; it is a bio-tank. That breaks down our household waste/sewerage and then supplies our garden lawn and orchard with the 'grey water'. This system is very affective as long as it is operating properly. A few factors can affect this. So all our household products; washing powder, dishwashing liquid/ dishwasher tablets, cleaning products... basically anything that goes down the sink has to be biodegradable. This is because the 'biological' process that breaks down our waste are worms! That and any liquid is pumped into the garden- so chemicals would kill both the worms and our plants/lawn. The biggest problem we have had with this system (not including the minor set back of cutting the irrigation pipes leading from the tank, which then flooded it in the wet season last year). Has been sourcing worms for it... in theory they should just multiply, but if anything were to upset them and they don't like water- so the flooded system meant they drown. We (or our plumber) needs to source more worms. So in the vain of self- suffieincy I decided to breed my own. That and to avoid being charged for the plumber to source them! When apparently they are very easy to keep yourself... I guess time will tell on that one. But our own supply for our bio-tank is not my only motivation for building a worm farm, as I am hoping a better understanding of these vital creatures will assist in our maintaining their numbers and survival within the tank itself. There are a number of suppliers out there, willing to assist with setting up our home worm farm, just Google composting worms. The worm farm itself will be constructed from a few recycled Styrofoam boxes, I purchased for a $1 each from a local veg store- I will blog about its construction again. Once the worm farm is up and running I am hoping it will also produce a very potent, natural fertiliser (liquid/ compost tea and vermicompost) for the gardens, veg patch (which apparently helps with drought tolerance- very important here! )and a food source for the birds! Hopefully win, win, win! I am not actually too concerned with the advertised benefit or reducing/recycling our waste. As the animals generally get first dibbs on our food scraps anyway. So having another species to divvy our scraps up between, may actually seem more of an inconvenience. Though they can also consume paper, cardboard, tea bags, coffee grounds, vacuum cleaner dust, animal manure, used animal bedding, garden clipping- things that at the moment I can only place in the over flowing compost bin. So the fact that they can consume their own weight per week should help with this. 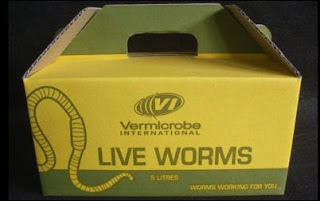 So now I am waiting for my worms to be delivered, as they are sent direct to your door. So be like a present when they arrive.